The weather this winter has been a bit cool – even by our New England standards. Of course, we have no complaints, though we have experienced some hefty cold fronts, wind, rain and overall cooler air than normal. When waiting out the weather, we usually tie up at a marina and seek out museums, science centers, history tours, etc. 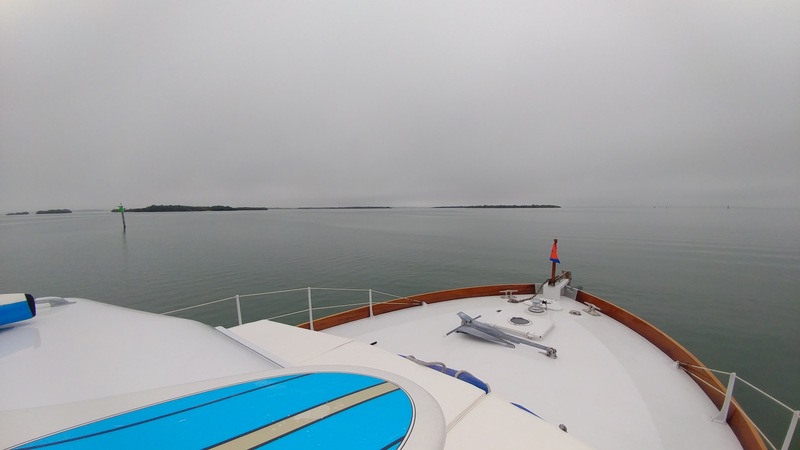 These are educational outings, but they also help us to get off a cold boat. 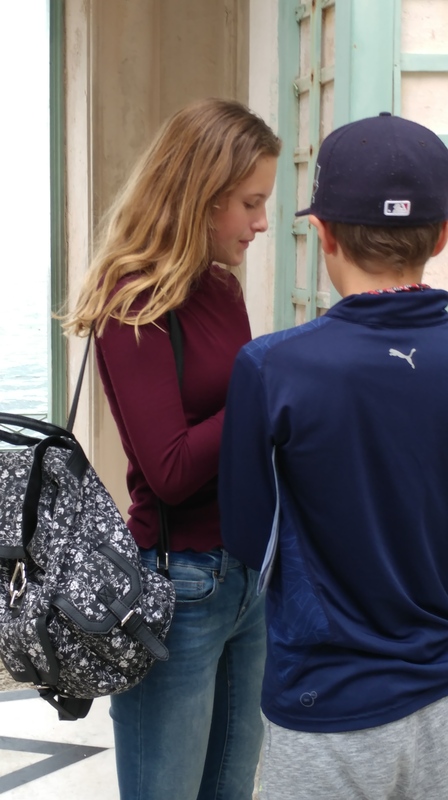 Sophia and Oliver at Vizcaya Museum and Gardens, Miami. 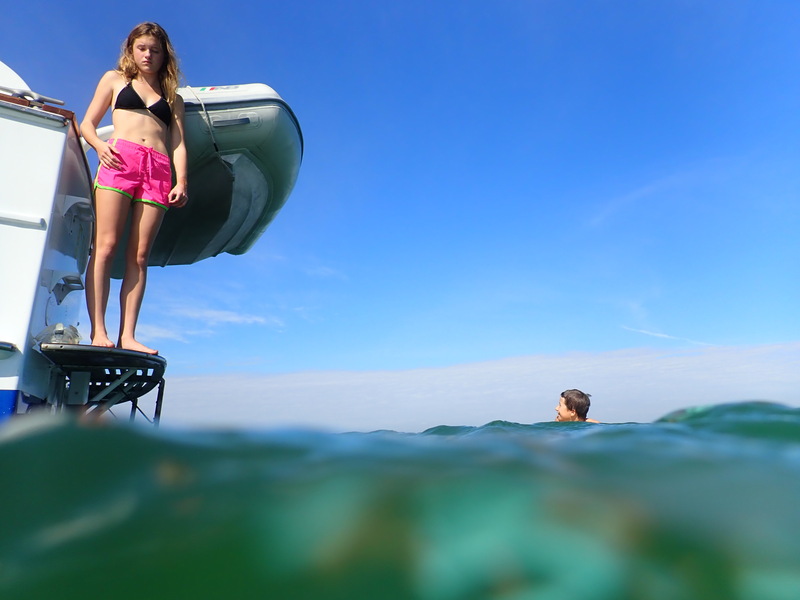 Sophia, above, is wisely cautious about jumping into the cold water of Biscayne Bay. Brave Oliver – already in for a brisk swim – is goading her on, of course. But, the weather is the weather and so we go about our days, living, learning and chasing the sun the best we can. However, more indoor-time, means more mess in the cabins. Art projects, giant puzzles, indoor workouts and extra cookie-baking make for a constant (endless?) need for cleaning and imperative boat-vacuuming. Our tiny house living gets smaller when the weather turns, just as any normal family would experience. While I concentrate on the interior, Tony and the kids pull out the wash buckets and scrub down the salty outside. Timbalero loves a good wash down. We dont mind the sisyphean boat work; we enjoy it actually. This boat gives us so much joy, it is the least we can do in return. Tony, supervising the crew’s work. 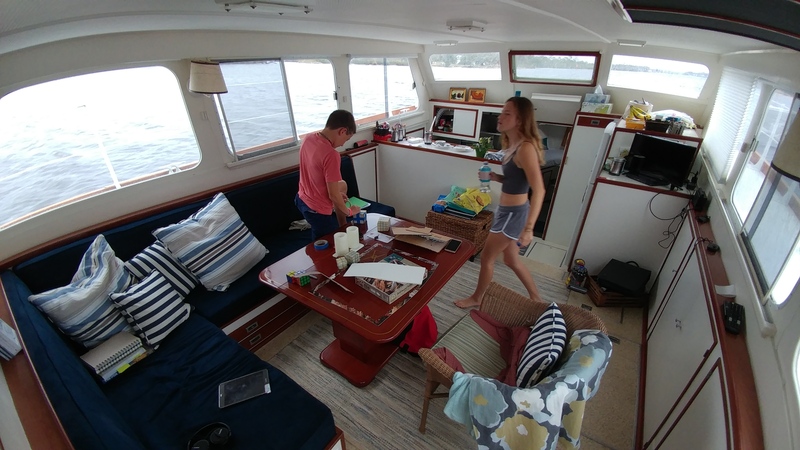 One thing of which I am certain: is there is a direct line between a tidy boat and a happy family. Perhaps ours is more picky than most, but we all seem to thrive when we have a clean space to move around in. We are certainly grateful for the break from the fierce New England cold this winter. Believe it or not, we miss it! So on colder days, we bundle up, roll down the eisenglass and latch tight the porthole windows. While we are moving locations (which can take several hours), Tony fires up the generator so I can make Timbalero Turkey Chili – a sassy, cold-weather comfort-food. I use an old Silver Palette-based recipe, which I modified for us and Timbalero’s smaller-sized crock pot*. It makes about 8-10 servings and will ensure your house (or boat!) smells amazing all day. Sauté meats, then remove from pot. In olive oil, saute onion, garlic, celery, squash and carrots. 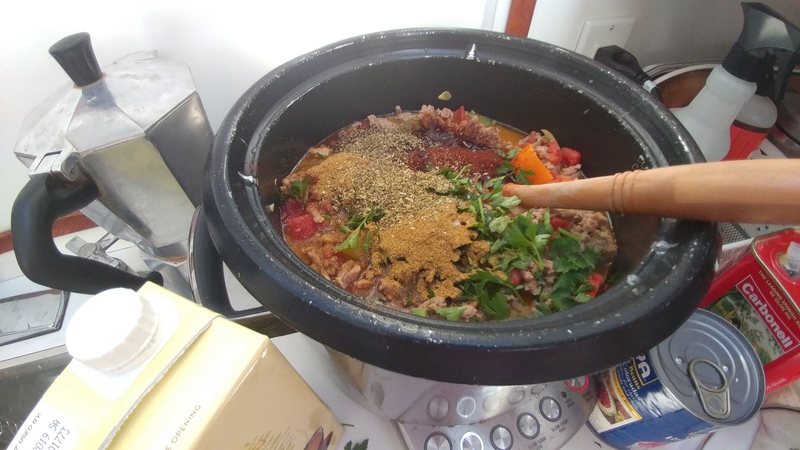 Then return meats to pot mixture, add remaining vegetables, spices, etc, stir and set on “SLOW COOK – HIGH” for 4-5 hours. Serve with rice or pasta, and garnish with fresh parsely. Optionals: sour cream, diced fresh red onion, shredded cheddar cheese, saltine oyster crackers. 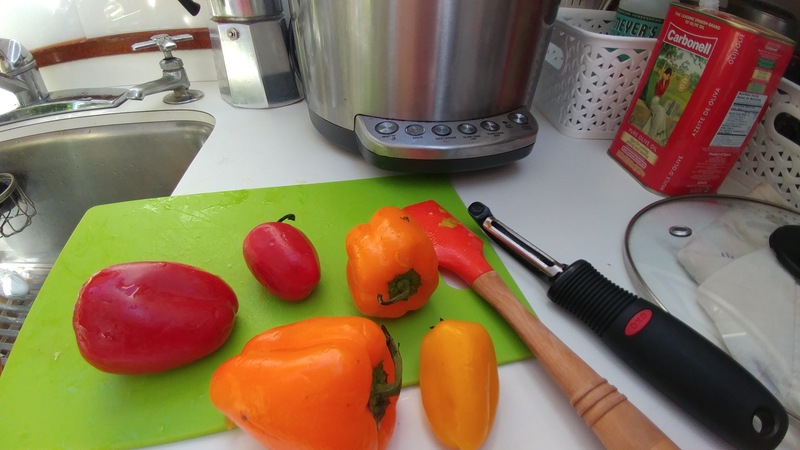 *We would not survive without my ace galley companion: the Breville 4 qt Risotto Plus… It has a host of functions and I use it in some way nearly every day. Details here: Breville Risotto Plus. I have never tried a vegetarian version of this chili, but I bet it would be delicious. If meat is not on your diet, then a book you must get is Jess Gumkowski’s new cookbook: YogiTriathlete Cookbook: High Vibe Recipes for the Athlete Appetite. I ordered my copy recently and cannot wait to dig into it. Jess and Bj are serial athletes and phenomenal in the kitchen. I am sure many of their recipes will fare quite well on Timbalero! Next Post Dam it, Florida!